More than half of the United States lie in a broad strip between the Appalachian and Rocky Mountains that is commonly called Tornado Alley. It has more tornado activity than any other area of the world. The rest of the country is not immune; tornadoes have occurred in every state. Each year, United States residents spend more than 3 billion person-hours under tornado watches (official alerts issued in areas experiencing severe weather that might generate tornadoes). According to the Wind Engineering Research Center at Texas Tech University, a tornado actually forms during more than half of these watches. During 1999, 13 states suffered a total of 30 fatal tornadoes causing 95 deaths. Although there have been no studies of the number of lives saved by storm shelters, there is broad agreement that properly constructed shelters are highly effective, not only in tornadoes—the most violent of wind storms, with winds sometimes exceeding 300 mph (485 kmph)—but also in hurricanes and other severe weather events. A family that wants to have their own storm shelter has three basic choices. They can build a monolithic dome home (a seamless concrete structure) that looks unconventional but is strong enough to withstand tornadic winds and debris impacts. Alternatively, they can heavily reinforce a room or closet in their conventional house, producing a "safe room" (in-residence shelter). At least one company sells an epoxy-coated steel panel kit for this purpose, and the Federal Emergency Management Agency (FEMA) offers free instructions for a do-it-yourself, reinforced concrete version in its book Taking Shelter from the Storm: Building a Safe Room Inside Your House. A third choice is for the family to build a shelter underground, beneath their house or nearby. These can be purchased as prefabricated units and installed in a few hours or they can be custom built on site. Manufactured shelter costs begin at less than $3,000, with installation adding on about $300-$500. Custom-built shelters can be as extensive as desired; one company that builds survival shelters for nuclear explosions as well as natural disasters suggests adding amenities such as a billiard room, bowling alley, or pistol shooting range. In general, however, storm shelters are small—often around 50 ft2 (4.6 m2) and about 6 ft (1.8 m) high—and intended to accommodate six to 10 people for only a few hours. The history of storm shelters overlaps with that of fallout shelters designed for protection from nuclear warfare. Threats to the security of United States territory during World War II, the uncertainty of the nuclear weapons era, and the Cold War between communism and democracy combined to launch the United States' first civil defense programs in 1949. In 1950, Congress authorized both a nationwide system of nuclear bomb shelters and a relief effort for victims of natural disasters. People were encouraged to build underground bomb shelters for their families and stock them with survival provisions. In tornado-prone areas, these shelters served a dual purpose. An underground storm shelter is a molded concrete structure that is buried in the ground and used as a protective shelter against tornadoes. (peaceful coexistence with communist governments), the focus of government-supported programs for civil defense shifted from military attacks to natural disasters. After a brief reversal during Gerald Ford's presidency (1974—1977), the focus returned to protection from natural disasters and peacetime accidents like that at the Three Mile Island nuclear power plant in 1979. Following widespread devastation from Hurricane Hugo and California's Loma Prieta earthquake in 1989 and Hurricane Andrew in 1992, FEMA's mission broadened from disaster relief and reconstruction to loss prevention. In accord with this philosophy, the federal government now offers financial incentives to homeowners who construct in-residence or underground storm shelters. Safe rooms are constructed of steel panels or reinforced concrete. Site-constructed underground storm shelters are usually made of reinforced concrete. Prefabricated underground shelters are made from various materials, including corrugated steel culverts, steel plate (perhaps galvanized or epoxy coated), reinforced fiberglass, high-density polyethylene, and concrete reinforced with rebar (steel rods) or fibermesh (fine, polypropylene fibers distributed uniformly through the wet concrete). Shelter doors or hatches are usually made from steel, fiberglass, or steel-plated plywood or aluminum. Stairs or ladders in underground shelters may be made of wood, aluminum, steel, or fiberglass. Stainless steel and zinc are used for other hardware items like bolts and anchor chains. Underground shelters come in various shapes including spheres, domes, horizontal tubes, and rectangular boxes. Most manufacturers offer their own patented designs, some of which are available in several sizes. They usually come with battery-powered lights, wall-mounted benches, and a ladder or stairs. Some manufacturers offer optional accessories like a chemical toilet, indoor-outdoor carpeting, a telephone jack, and a weather-band radio. To minimize the risk of occupants being trapped by debris covering the door, some shelters are equipped with a hydraulic or screw jack for forcing open the door. Other models feature a second, emergency exit hatch at the end of the chamber opposite the entrance. Safe rooms are readily accessible to the handicapped. Most underground shelters are not designed for entrance by mobility-impaired persons, but a few manufacturers offer some models that are. Canton Enterprises' horizontal-entry version, for example, can be recessed into a hillside, or it can be installed at ground level and have dirt banked around its walls. The following description is representative of the manufacturing process for a prefabricated, reinforced concrete storm shelter. Certain details may vary among manufacturers. The oldest known photograph of a tornado sighted on August 28, 1884, near Howard, South Dakota. A tornado is a rapidly spinning column of air formed in severe thunderstorms. The rotating column, or vortex, forms inside the storm cloud then spirals downward until it touches the ground. Although a tornado is not as large as a thunderstorm, it is capable of extreme damage because it packs very high wind speeds into a compact area. Tornadoes have been known to shatter buildings, drive straws through solid wood, lift locomotives from their tracks, and pull the water out of small streams. An average of 800 tornadoes strike the United States each year. Based on statistics kept since 1953, Texas, Oklahoma, and Kansas are the top three tornado states. Tornadoes are responsible for about 80 deaths, 1,500 injuries, and millions of dollars in property damage annually. While it is still impossible to predict exactly when and where tornadoes will strike, progress has been made in predicting tornado development and detecting tornadoes with Doppler radar. 1 Steel molds are used to cast the upper and lower sections of the shelter. Walls are 3-4 in (7.5-10 cm) thick, while floors and ceilings are 5-6 in (13-15 cm) thick. 2 Metal reinforcement is placed in each mold. For example, one manufacturer uses 0.5-in (1.3 cm) diameter steel rebar placed at 12-in (30-cm) spacing. 3 Concrete is poured into the mold. The mold is vibrated to minimize air bubbles. 4 When the concrete has set, the shell is removed from the mold and inspected for flaws. 5 The top and bottom halves of the shell are joined. Their edges are designed to interlock, and a tar sealant or waterproof mastic is applied prior to mating the two pieces. Steel straps are placed across the seams and bolted in place to reinforce the joint. 6 Steps or a ladder are installed. The door is mounted using multiple hinges, a piano hinge, or a frame that allows the door to slide open and closed. One or two air vents are installed. Each consists of a vertical pipe topped with either a wind turbine or a screen-covered 180° elbow. The installation procedure is similar for all types of in-ground shelters. The following description mentions there refinements necessary for each type. 7 A backhoe is used to dig a hole for the shelter. A worker with a shovel hand-finishes the hole, leveling the bottom and clearing the corners. The hole should be about 2 ft (61 cm) larger than the shelter in each dimension. 8 The backhoe or a crane-equipped tow truck is used to lift the shelter and lower it into the hole. Some shelters are equipped with fittings that the lifting device can grasp. Others are lifted by chains attached to brackets on the outside of the shelter or by a pair of nylon straps wrapped vertically around the shelter. 9 A prefabricated reinforced concrete shelter weighs at least 12,000 lb (5,500 kg). The smallest sizes of steel and fiberglass shelters weigh about 3,500 lb (1,600 kg) and 1,400 lb (640 kg), respectively. Because they could float if the ground became saturated, steel and fiberglass shelters must be anchored during installation. This is usually done by bolting or chaining them to mounts embedded in a concrete foundation. Some manufacturers also recommend pouring concrete around the shelter's walls. 10 If concrete is not poured around the shelter, soil excavated from the installation site is generally used to backfill the remaining void around the shelter. 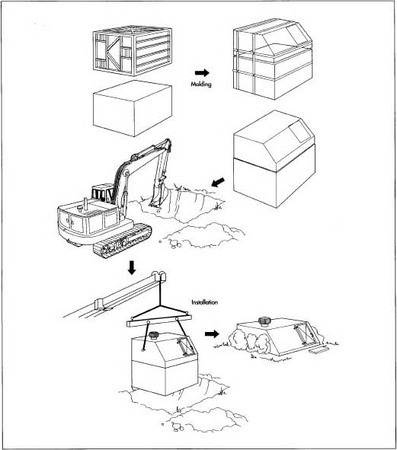 If the shelter is also intended to function as a bomb shelter, backfilling consists of gravel or crushed rock. 11 Some underground shelters are installed with their tops at ground level, but most are designed to be covered with 2-3 ft (61-91 cm) of soil. The surface may then be planted with grass or topped with patio decking. FEMA bases its acceptability standards for storm shelters on research conducted at the Wind Engineering Research Center. Since 1970, the center has studied the damage caused by 100 windstorms and tornadoes. It found that the greatest threat to people is flying debris that can penetrate windows, walls, and roofs of buildings, forcibly striking occupants. Shelter designs can be tested in the center's laboratory to determine their ability to withstand the impact of a 15-lb (6.8-kg) section of 2x4-in (5xlO-cm) lumber fired by a compressed-air cannon at speeds of 100 mph (160 kmph) for walls and doors or 67 mph (120 kmph) for roofs. A FEMA-acceptable shelter must also be able to withstand winds of 250 mph (400 kmph); very few tornadoes exceed this wind speed. In addition to the standard tests, some manufacturers tout their product's ability to withstand somewhat more creative trials. For example, one advertises that its shelter withstood the impact of a minivan, and another reports its unit stopped a 38-caliber bullet. As part of its inspection of each shelter produced, one manufacturer fills the completed shell with water to verify that it is water-tight. Storm shelters are usually made out of concrete or steel, but recent technological developments have shown that fiberglass is becoming very popular. Older shelters tend to rust or corrode after many decades of being exposed to the worst of the elements. Mildew is also a large factor in underground shelters. Fiberglass is mildew resistant and usually guaranteed not to rust or corrode. Advances have also been made with new steel and concrete models. Many companies sell warranties with their shelters promising that they will not leak, rust, or float. E-Z Kit Safe Room. http://www.twisterpit.com/ez_kit.htm (April 15, 2000). "Inresidence Shelters for Protection from Extreme Winds." Texas Tech University Wind Engineering Research Center. http://www.wise.ttu.edu/inshelter/inshelte.htm (April 12, 2000). Jarrell Storm Shelters. http://www.jarrellstormshelters.com (April 13, 2000). Storm Shelters USA. http://www.sheltersusa.com (April 14, 2000). "Taking Shelter from the Storm: Building a Safe Room Inside Your House." Federal Emergency Management Agency (FEMA). http://www.fema.gov/mit/tsfs0l.htm (April 11,2000).